Can someone please upgrade the security system at Wayne Manor? For the umpteenth time on Gotham, it was broken into yet again. This time it was done by the long haired “clone” of Bruce Wayne from Indian Hill. I’ll give the show this; that was a great cliffhanger to increase the anticipation until next week. Speaking of Bruce, the groundwork established by this episode is setting the table nicely for Bruce to have the standout story of the season. Given that he’s going to be Batman after all, it’s about time he grabs the bull by the horns. Bruce bookended the episode, and both scenes were the standout moments. At the beginning, Bruce confronted the representative (or leader) of The Court of Owls. Their agreed truce, like most things on this show, isn’t built to last. Bruce is too idealistic and curious to let this conspiracy go, even if it puts him and Alfred at risk. I like that Bruce has grown to be more responsible in the name of preserving his family’s legacy. In the final scene, I like the display of shock and confusion shown by actors David Mazouz and Sean Pertwee. It was surprisingly minimalist in a show that’s often over relied on broad strokes. Make no mistake though. The arrival of a rejuvenated Ivy definitely brought the over the top aspect back to the forefront. It wasn’t a surprise to see her, what was shocking was her decision to kill a man because he didn’t water his plants enough. Granted, that’s very much in line with how the character has been portrayed in the comics but it came out of nowhere. 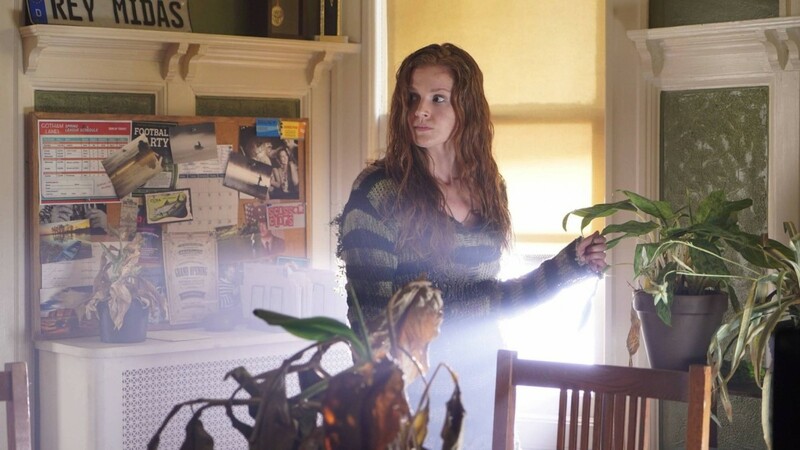 The Ivy we saw in the earlier episodes was just a peripheral character with a plant motif. This was definitely a shocking departure but it lacked the set-up to really hit as it wanted to. That said, it was the least engaging of everything in this episode. As I stated in my review of the last episode, Gordon’s bounty hunter persona is far more interesting than his run as a cop. After all, his morality is questionable to say the least. In this episode, Gordon acted more villainous than Penguin did. Not only did he risk the lives of Gotham’s citizens to save Bullock, he helped Fish escape with Strange, only to lead her to Penguin. His new change in attitude has also gotten him a kiss from Valeria Vale, a far cry from his past relationships (and coincided with Leslie’s return to Gotham). We even got to see Gordon have a reunion of sorts with Barbara. I liked how Gordon was shown to be incredibly uneasy in her presence and I’ve grown to really enjoy crazy Barbara. Speaking of other sides to characters, Penguin showed his softer side during the confrontation with Fish. After being hell-bent on killing Fish, he had the opportunity to eliminate both she and Hugo Strange for their past misdoings. Considering all he’s been through at their hands, it was strange to see him grow a conscience all of a sudden. Fish’s speech about how she helped shape him into his Penguin persona did possess a surprising amount of truth to it. It is also one of the best moments for Fish as a character. You could also make the argument that perhaps Strange’s experiments blocked out some of his nastier memories. That said, it was a bit of a reach to see Penguin allow for their escape, which could potentially affect his popularity in the city if discovered. Based on what transpired during this episode, it’s hopefully a sign that Gordon will stay removed from the G.C.P.D. He’s fully outside of the law (and common decency for that matter), which makes him more interesting as a character. With the impending arrival of Lee back into his life, hopefully we won’t have to suffer through a clichéd love triangle between Lee, Gordon and Valerie. That unnerving thought aside, much of this episode felt like a transition into what’s to come. Whether it’s Penguin’s increasing presence in the public eye or the soon to come appearance of Mad Hatter, it looks like “Mad City” is the perfect subtitle for season 3. Next ArticleTV Review: Brooklyn Nine-Nine 4x1 "Coral Palms Pt. 2"